SUMMER 2019 Aistear - Play, Literacy and Numeracy (infants) Using Play as an active learning methodology to enable pupils to: • Be an active agent in their own learning • Learn through language • Clarify and interpret experience • Learn through guided activity and discover Actively engage with their immediate environment - this firsthand experience provides a reference framework for the understanding of more abstract concepts English - learning through language: • Emphasis will be placed on the interaction of language and experience enabling the child to clarify and interpret experience, to acquire new concepts and to add depth to concepts already grasped. In Mathematics, pupils will be enabled to develop the following skills: • Applying and problem solving • Communication and expressing • Integrating and connecting • Reasoning • Implementing • Understanding and recalling Venue: St. Marys and St Benedict's Dates: July 1st-5th Facilitator: Aimee Flynn Booking Fee : €50.00 To book a place and pay with credit card please go to www.ecdrumcondra.ie and click on COURSES/CPD Please note that Teaching Council Number must be quoted when making a booking. SUMMER 2019 Digital Storytelling in the Classroom: Animation This creative summer course for 2019 by PDST TiE will introduce teachers to the skills involved in the animation making process as they work towards creating their very own short animation. Each module in this course is designed to encompass a hands-on approach to learning and mirrors the process, step by step, that participants can use when undertaking animation making in their own classrooms. Participants will be guided through the animation making process, while also learning how this may be applied to a classroom setting to support and enhance pupils’ literacy development across the curriculum, and in particular in relation to visual arts. Throughout the week, participants will gain insight into the range of skills associated with animation making which their pupils can develop through the effective use of digital technologies, such as those associated with planning, shooting and editing stages. Importantly, participants will also gain an appreciation regarding the importance of the animation industry in Ireland, as a world leader in this area. Content in this course shall also focus on the Fís Film Project, a highly successful film project for primary schools that explores film as a medium of expression in relation to the arts, and introduces children to aspects of the filmmaking process. Here, useful resources as well as examples of note for use in the classroom, will be discussed and explored. Venue: Drumcondra Educa on Centre Date: 1st-5th July Tutor: Ciaran Burke Booking Fee: €10 This course is funded by PDST Technology in Educa on To book a place and pay with credit card please go to www.ecdrumcondra.ie and click on COURSES/CPD Please note that Teaching Council Number must be quoted when making a booking.. Please note that Teaching Council Number must be quoted when making a booking. SUMMER 2019 Gaelic Games-enhancing the delivery of PE, and integration with other curriculum subjects Blended Course (3 days on site 2 on line) Course content: • Introducing GAA to primary schools • Early Childhood- Nursery & Fundamental Stages • Games Specific Hurling Skills Teaching • ‘Begin with the end in mind’ Programme planning, designing and implementation • Introduction to FUNDO learning resource material: ‘Class room to Playing field’ • Specialised equipment, usage and safety • ‘Raising the tempo’ – Warm up activities • Introduction to GAA Céim ar Aghaidh Step a head resource pack • Introduction to GO Games • GO Games: Small sided games/Conditions • Maximising space: Hurling wall, hall & yard games • Introduction to Ladies football. 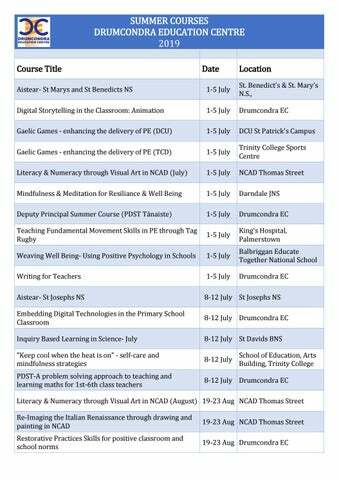 Venue: Trinity College Dates: July 1st-5th 2019 Facilitator: Conor Laverty Booking Fee: €50.00 To book with credit card log onto www.ecdrumcondra.ie and Click on Courses/CPD Please note that Teaching Council Number must be quoted when making a booking. Enhance Literacy and Numeracy skills in pupils through the medium of drawing, clay, fabric and fibre. Explore Literacy and Numeracy in a expressive manner through the use of drawing, clay, fabric and fibre. Develop numeracy skills through the exploration of patterns and tessellations. Be able to explore mark-making through the use of variety of media to show shape, form, texture and pattern. Be enabled to experiment with and develop line, shape, form, texture and pattern in clay using a variety of techniques and tools. To book a place with credit card go to www.ecdrumcondra.ie and click on Course/CPD Please note that Teaching Council Number must be quoted when making a booking. To book with credit card go to www.ecdrumcondra.ie and click on Courses/CPD Please note that Teaching Council Number must be quoted when making a booking. SUMMER 2019 Deputy Principal Summer Course (PDST Tánaiste) Tánaiste is a leadership summer course designed specifically for Deputy Principals and Acting Deputy Principals, at Primary level, and provided by the PDST. PDST School Leadership (Formerly LDS) have been delivering high quality CPD for school leaders since 2002. The course provides opportunities for deputy principals to explore their leadership role in order to lead high quality teaching and learning in their school. It provides an opportunity to learn from facilitators and colleagues in similar roles with all resources having been designed or nuanced to reflect the deputy principal role. The course has an emphasis on effective communication and conflict management strategies, on the principal and deputy principal as a leadership team, distributed leadership as well leading change and positively impacting on the school’s learning culture. Venue: Drumcondra Education Centre Dates: July 1st-5th 2019 Facilitator: PDST Leadership Team Booking Fee: Free of charge To book a place go to www.ecdrumcondra.ie and click on Course/CPD Please note that Teaching Council Number must be quoted when making a booking. SUMMER 2019 Teaching Fundamental Movement Skills in PE through Tag Rugby The aim of this summer course for teachers is to introduce Tag Rugby to teachers’ PE classes as a means of helping in the acquisition of an appropriate range of movement skills across the PE strands. Largely practical based, the course will examine Fundamental Movement Skills, Fundamental Games Skills and Game Specific Skills. There will be an emphasis on pedagogical skills, teaching methodologies and class management skills building on existing knowledge in PE to allow teachers to adapt lessons to pupil’s interest or to include children with special educational needs. It will also highlight ways to integrate numeracy, literacy & SPHE programmes in a cocurricular way. The Course will be delivered by Coach Development Officers and Community Rugby Officers from Leinster Rugby. To book a place on any course please go to www.ecdrumcondra.ie and click on Courses/CPD Please note that Teaching Council Number must be quoted when making a booking. To book with credit card please log onto www.ecdrumcondra.ie and Click on Courses/CPD. Please note that Teaching Council Number must be quoted when making a booking. We will experience the writing process as writers and teachers, exploring strategies that improve pupils’ writing. We will explore together a full range of writing processes in a Supportive, enjoyable writers’ workshop environment. In this writing workshop environment we’ll each have a Writer’s Journal to collect, try out and share ideas and best practice. Together we will try out a variety of prompts and approaches as a group of writing teachers/teaching writers. Professional development that can be personally enriching-not scary - we intend to have fun! So give it a go—sign up “write” now. To book a place with credit card go to www.ecdrumcondra.ie and click on Courses/CPD Please note that Teaching Council Number must be quoted when making a booking. SUMMER 2019 Aistear - Play, Literacy and Numeracy (infants) Using Play as an active learning methodology to enable pupils to: • Be an active agent in their own learning • Learn through language • Clarify and interpret experience • Learn through guided activity and discover Actively engage with their immediate environment - this firsthand experience provides a reference framework for the understanding of more abstract concepts English - learning through language: • Emphasis will be placed on the interaction of language and experience enabling the child to clarify and interpret experience, to acquire new concepts and to add depth to concepts already grasped. In Mathematics, pupils will be enabled to develop the following skills: • Applying and problem solving • Communication and expressing • Integrating and connecting • Reasoning • Implementing • Understanding and recalling Venue: St. Josephs NS Ballymun Dates: July 8th—12th 2019 Facilitator: Nicola Lee Booking Fee : €50.00 To book a place and pay with credit card please go to www.ecdrumcondra.ie and click on COURSES/CPD Please note that Teaching Council Number must be quoted when making a booking. SUMMER 2019 Embedding Digital Technologies in the Primary School Classroom Participants on this course will explore a range of digital tools that they can easily integrate into their classroom. Simple changes in the teaching, learning and assessment tools can increase active learning, cut down on the time spent searching for resources and sources of information and facilitate engaging forms of assessment! Teachers will interact and experiment with an array of tools, websites and technologies throughout the course. They will use these tools in activities that can be adapted and replicated in their own classrooms. Questions and issues explored in the course include: ● Where can my pupils access safe trustworthy information online? ● What resources are out there specifically for Irish classrooms? ● How can I make assessment an engaging component of my lessons? ● Where can I find resources to deal with online safety and cyberbullying? ● How can my school plan together to embed Digital Technologies in teaching, learning and assessment using the Digital Learning Framework? 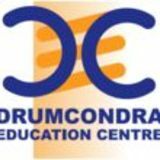 Venue: Drumcondra Educa on Centre Date: 8th-12th July 2019 Tutor: Eoin Walsh Booking Fee: €10 This course is funded by PDST Technology in Educa on To book a place and pay with credit card please go to www.ecdrumcondra.ie and click on COURSES/CPD Please note that Teaching Council Number must be quoted when making a booking. Participants will engage in Scientific Inquiry to : ➢ Increase confidence and skills in teaching primary Science. ➢ Integrate open-ended, problem solving within the classroom. ➢ Develop their students dialogical and thinking skills through Science. To book your place with credit card log onto www.ecdrumcondra.ie and Click on Courses/CPD Please note that Teaching Council Number must be quoted when making a booking. To book a place go to www.ecdrumcondra.ie and click on Courses/CPD Please note that Teaching Council Number must be quoted when making a booking. SUMMER 2019 Re-imaging The Italian Renaissance through Drawing & Painting in NCAD During the 5 day summer course participants will examine and explore the potential of selected Renaissance images and re-image them through Drawing & Painting under the expert guidance of Art Historian and Painter, Anne-Marie Keaveney. Work will be executed in acrylics on prepared paper and issues of Composition, Colour Mixing and Mark Making will all be explored, collectively as well as by individual tuition. Advice and guidance will be given on editing the images, preliminary drawings, preparation of painting supports as well as paint application and a variety of painting techniques. Provide participants with knowledge and understanding of the use of RP in schools; Skill participants to use RP to support their teaching practice; Skill participants to use RP to support their work and life outside the classroom; Inspire and enable participants to use restorative skills in their work and life; and Explore the potential of a Restorative approach for creating and maintaining a positive relational environment in the classroom and school as a whole. Fee: €50 To book with credit card go to www.ecdrumcondra.ie and click on Courses/CPD Please note that Teaching Council Number must be quoted when making a booking.